Immediately after the Camisea Gas project in Peru we were asked to relocate our entire (hovercraft) logistics operationon to Coari in the Brazilian rain forest to provide distribution services transporting pipe to locations thoughout the rain forest where teams of local labour were laying pipe beneath river beds during the dry season. We took the hovercraft from Atylaya Peru overland to Coari Brazil under its own power because of the urgency of the project.. Over 1800 miles of swampand obsticles in low or dry rivers had not previously tried. With most of the team on leave at the end of the Peru project I was one of a two man crew to take the hovercraft across the continent which may be a world record for overland hovercraft journies. 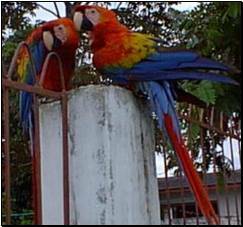 Part way,at Iquitos we collected a 3rd crew member returning early from his leave to join us on the journey. One Cadadian, one Brit and now one Australian made up the team that arrived in Coari to start a new project. 1800 miles doesn't sound much if you're talking "trucking" but 40 tons of hovercraft in narrow twisting rivers, swamps and occassionaly across land is a long way. There are no fuel stations on the way but we are a resourceful team and arrived in Coari without incident. The contractor laying pipe for the oil company client had dead lines to meet, not only contractually but dead lines set by the seasons. 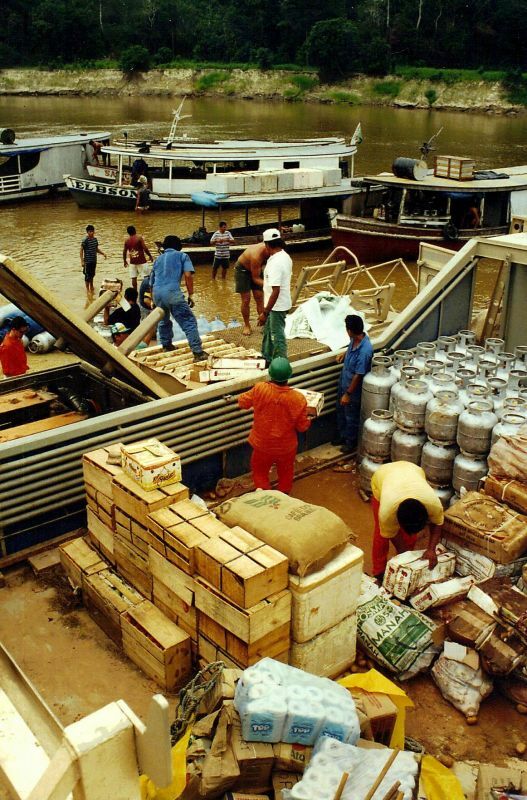 Laying pipe under the river bed wouldn't be possible in the wet season and delivering pipe wouldn't be posisble in the dry season by the more conventional push boat and barge method. 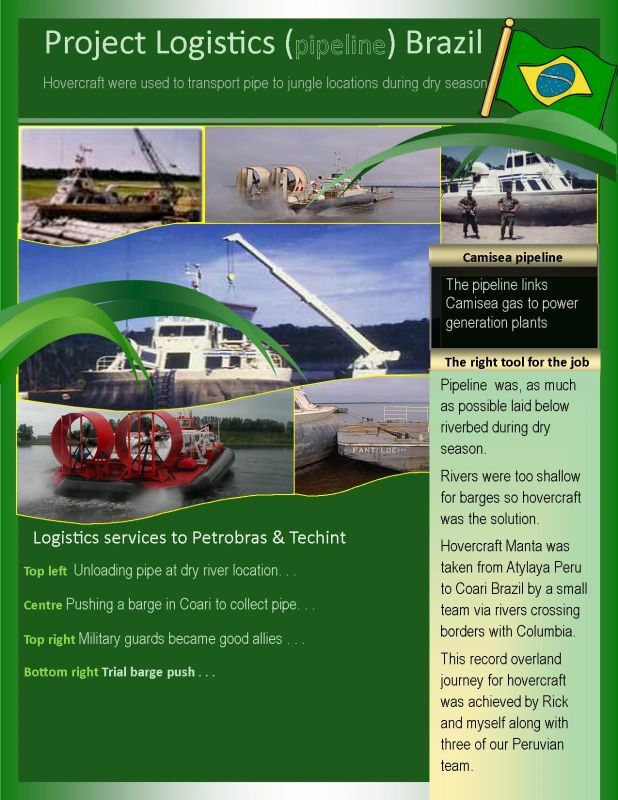 Hovercraft was the solution allowing pipe distribution to enable pipe laying before the wet season. 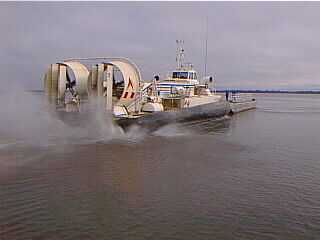 Hovercraft Manta (trial) pushing a barge in Coari Brazil. The pilot who had as much mechanical ability as a monkey in a straight jacket set about making the drinks and securing the load whilst I plunged into the river to recover the rudders, refit them then stood chest deep in the river sewing up the torn skirt with a ball of twine and a Swiss army knife. It took time but we were back on our way and arrived just ten minutes after 6pm. The sun had set and the camp had stopped work for the day so we had to sleep in the hovercraft until day break when we could unload the cargo. It was during that stay over that we studied the map more carefully hoping to convince ourselves that it wasn't really our fault but a freak accident when we noticed the name of the river where the incident happened. When translated it into English said "Pirana River". I'm glad I didn't know that earlier.